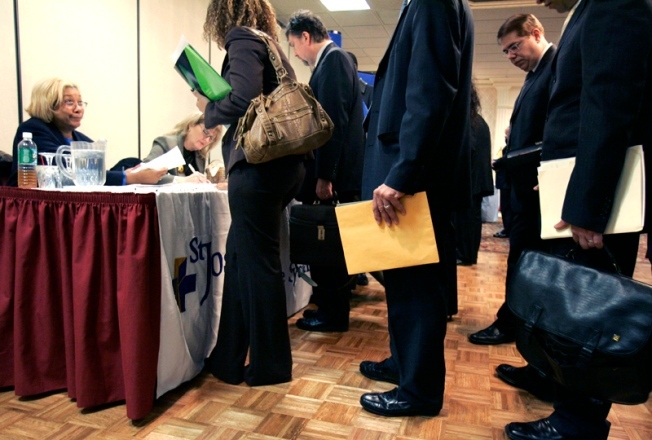 People line up at a job fair - the U.S. unemployment rate is now at a 14-year high. The U.S. economy took more devastating hits on Friday - stark proof that the nation is almost certainly in a recession. The nation's unemployment rated bolted to a 14-year high in October as another 240,000 jobs were cut, the government said in a bleak new report. Things could get even worse as two of the major automakers also delivered grim financial news. GM said it had posted a $2.6 billion third-quarter loss - and that it could run out of cash by next year. Meanwhile, Ford announced plans to slash another 2,260 jobs from its North American payroll. The jobless rate hit 6.5% in October, its highest level since Bill Clinton's first term in office. A report released by the Labor Dept indicated that employers released nearly a quarter-million people from their jobs, making the job market the worst since March 1994. October is the 10 straight month that the economy lost jobs this year, i.e. every single month, and revisions of prior figures showed that job losses reported in prior months were actually much worse than originally thought. Simultaneously, talks between Chrysler and GM broke down as the severity of the latter company's financial position became clear. GM posted a $2.5 billion loss during the quarter ended Sept 30th. Company executives warned investors that given its current burn rate, GM could completely run out of cash in 2009. Revenues declined more than 13% year over year, to $37.9 billion, as consumer demand dried up and auto sales evaporated. Ford only lost $129 million during the third quarter, due to an offsetting $2 billion one-time gain from transferring health care liabilities to the United Auto Workers. The company simultaneously had a negative cash flow of $7.7 billion. Executives announced that they would be trimming 2,260 white collar jobs from its workforce in the near future. Sales dropped 22%, to $32.1 billion, due to lower auto sales and the removal of Land Rover and Jaguar sales from the top line after Ford sold those businesses. Trading in GM shares was halted prior to the announcement of its third-quarter results and an the price was down more than 10% by mid-afternoon. House Democrats are calling for a multi-billion bailout package for U.S. automakers, virtually equal in size to an existing $25 billion aid package to help retool auto production to create more energy efficient vehicles.